Twenty sets of fashionable outfits created by aged or disabled designers, in pairing up with about 100 students of The Hong Kong Polytechnic University (PolyU), were showcased in the catwalk of the “Youreable” Fashion Design 2018 Award Presentation Ceremony today (6 April). The ceremony was officiated by Mrs Carrie Lam, the Chief Executive of the Hong Kong Special Administrative Region, who was presented with a jacket entitled “United Hong Kong” (團結香港) for wearing on stage. The outfit was specially designed and tailor-made for Mrs Lam by wheelchair-bound designer Ms Ng Kwei-ling. “Moreover, PolyU students who have taken part in this event as their Service-Learning over these years have learnt much more than just getting their ‘homework’ done. 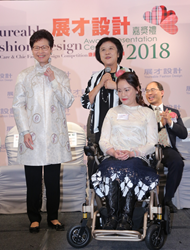 They have learnt a lot from the sharing with the aged and the disabled, and have gained valuable experience in applying their professional knowledge, communication abilities and team spirit to help accomplish the ‘mission’ for the designers,” said Mr Chan. The 20 outfits showcased today were shortlisted from more than 350 entries submitted from over 50 non-government organisations – a record high number for the “Youreable” Fashion Design, which has been organised by the Troels H. Povlsen Care Apparel Centre under PolyU’s Institute of Textiles and Clothing since 2009. Over the past months, the 20 shortlisted participants joined workshops, and worked closely with PolyU students in fabric selection, fitting and garment making to turn their creative ideas into reality. The event this year has newly added a Care & Chic Fashion Design Competition for secondary and post-secondary students to create apparels with functional adaptive design for the disabled and, at the same time, attractive and chic for abled persons. Out of around 30 submissions, 10 sets of inspiring outfits were shortlisted, and produced with the support of PolyU students. The outfits were also displayed by abled and disabled models together on the catwalk today, to exemplify the spirit of social integration. Established in 2006, the Troels H. Povlsen Care Apparel Centre under the Institute of Textiles and Clothing of PolyU is an original and innovative centre in the Far East region. The Centre is dedicated to promoting and making care apparels for the elderly and the disabled, through applying the joint efforts of garment making experts, rehabilitation specialists, healthcare professionals and social scientists.